I remember one particular summer afternoon six years ago while training with a friend for our first 10k race. I distinctly remember saying after what was probably a 4-5 mile run that “I could never run a marathon”. Well, this past weekend I gave myself a huge dose of “never say never” when I completed my first marathon, the Marine Corps Marathon! The race weekend for me started on Friday. I stayed at the Hilton in Crystal City (very nice hotel with great staff and location, I’d recommend) where my afternoon/evening was spent catching up on work lying in bed watching HBO and scanning iTunes for songs to add to my marathon playlist. Super exciting stuff! But really, race weekend is all about staying off your feet until it’s go time. Saturday I ran a quick 2 miles to shake out my legs and get ready before my boyfriend, Bill (aka my marathon cheer team and photographer), flew into DC. Bill and I spent the afternoon waiting in line at the MCM expo to get my bib number. And then waiting in line to get into the actual expo. And then wading through crowds inside the expo. 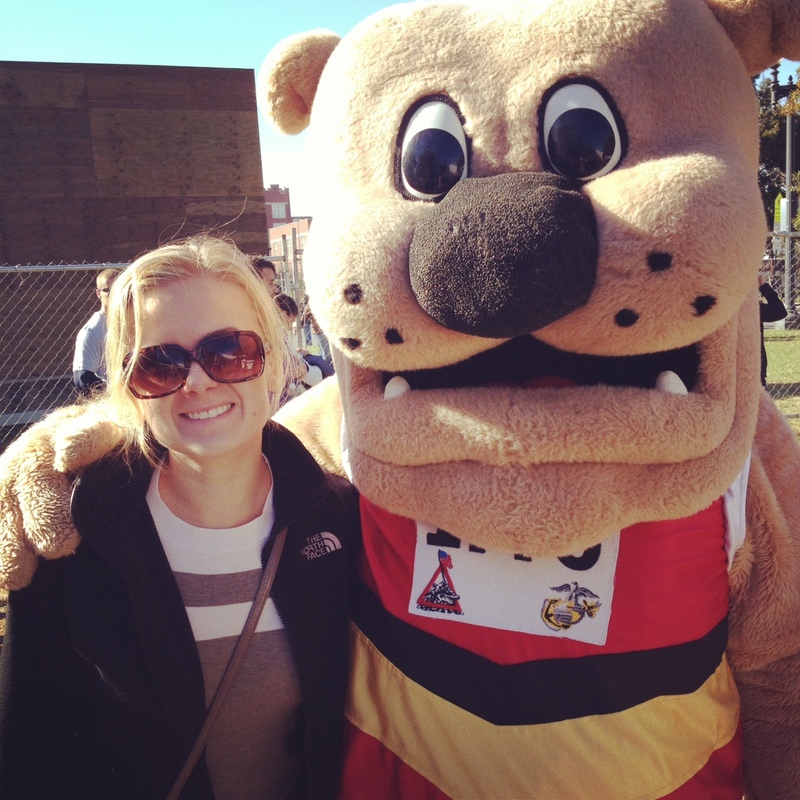 At least the bulldog mascot kept me company and 26.2 photo ops kept me entertained. The expo itself was ok, I’m a sucker for freebees and thought this expo was seriously lacking, but I managed to snag the second to last official race jacket so it wasn’t a total wash.
Let’s get to the good stuff now – Sunday morning. RACE DAY. Race day weather could not have been better: cool, dry and a bit overcast. 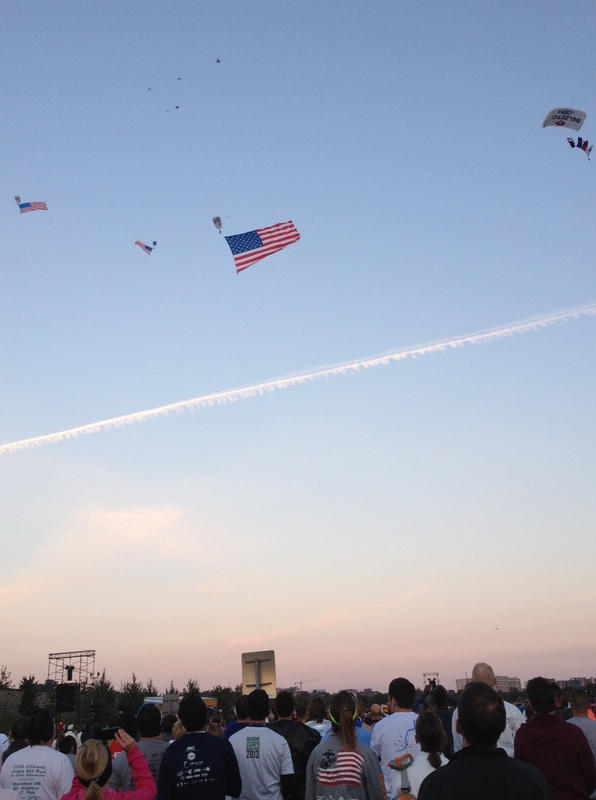 The race began with the national anthem and an amazing ceremony involving sky divers with HUGE American flags coming down from the sky, truly something where pictures don’t do justice… but I tried anyways. When the race started I was keeping an eye on the 3:45 pace group, a group that I thought I could stick with but wouldn’t be a total cake walk. A couple of miles in I decided to make a dash for the porta-potties, something I’ve never done during a race, since the lines for porta-potties before the start were ridiculous. As quick as I was, I knew the pace group was out of sight once I was back on the road and it was really just a matter of trying to find a pace I was comfortable with which was not easy with the amount of people on the road – 30,000 registered runners for the marathon, that’s a lot of people hitting the pavement. At mile 6 I found Bill on the route in Georgetown and was so happy to see him. Georgetown provided some really pretty views along the roads with high-arched bridges to run under and greenery, but really when is Georgetown not perfect? (Answer = never.) Between Georgetown and the National Mall is a bit of a blur, but I spent a lot of that time reading signs that people had along the route. A couple of my favorites were: “You’re running better than the US Government” and “In Soviet Russia, marathon runs you”. I was surprised how much I was entertained by the signs and spectators along the route, it made the miles go by quickly. The crowd support throughout the entire race was amazing, it was great to have so many people out there cheering us on and passing out candy and Vaseline. Candy and Vaseline, every runner’s two favorite things. 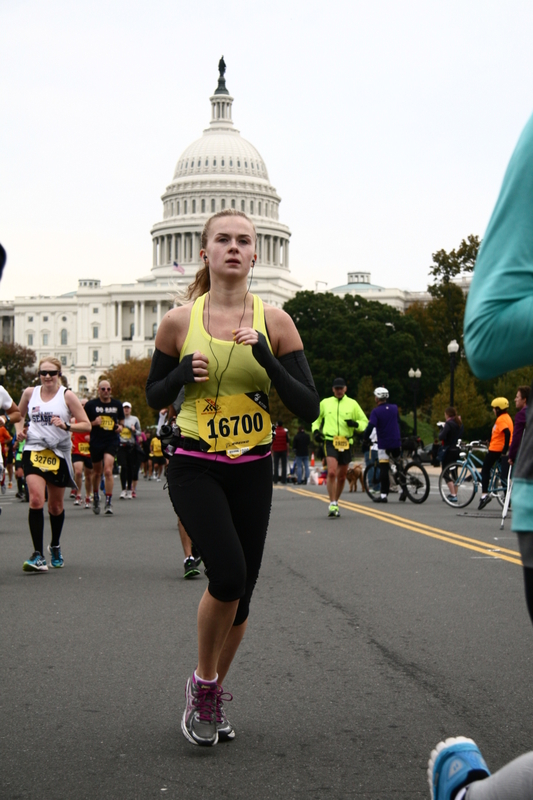 Running around the mall and in front of the Capitol were great, the energy there from the crowd was fantastic and the sights were wonderful to take in. I hadn’t been watching my pace since the 10k mark and opted to get into a groove and feel it out. Mistake? Maybe. I knew my time would be hurt from having to run to a bathroom early on and not knowing my burn-out point beyond mile 20, I wanted to make sure I still had enough in the tank to finish the race strong. At mile 20 the MCM has what’s called “beat the bridge” aka you need to get to this point in the race at a certain time otherwise you are re-routed and don’t finish. Or as I like to think of it, “the point where you run across a super boring, long, cement-paved bridge where the sun decides to come out and you have no shade”. This was probably the toughest part of the race for me for a few reasons. First, the bridge was right after the 20 mile marker so my mind immediately started to acknowledge that everything beyond this point is totally new for me physically and mentally. Also, did I mention it was incredibly boring? And long? All of that combined messed with my head for about 10 minutes before mentally pushing it out and just telling myself to stay consistent with my pace, I was actually surprised how good I felt physically. 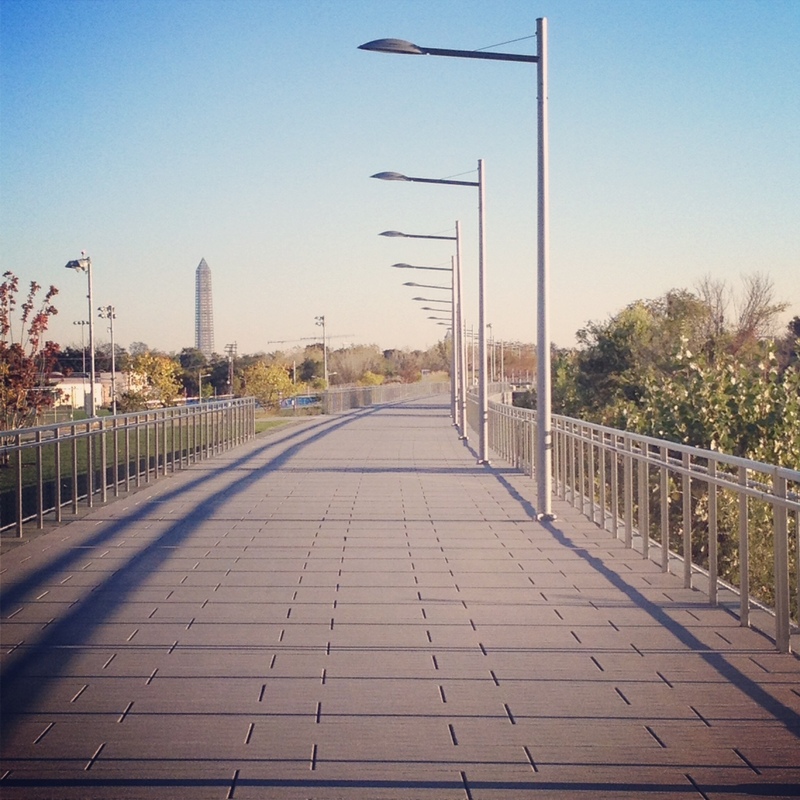 Mile 22-24 went through Crystal City was a really cute part of the route and before I knew it I was at mile 25, and then ohmygosh mile 26 and then…. A wall. Not the wall. A wall, of pavement, which turned out to be an extremely steep albeit short (100 yds or so) hill right before the finish line. Honestly I laughed at this point and thought to myself, “of course the Marines give us a steep hill at mile 26.1 – let’s do this!” and I powered through it across the finish line where I stopped and my muscles immediately seized up. Woohoo! I got my medal, which I think is pretty badass looking, and got food and water and hobbled around like a little old lady. So what are my overall impressions? At the expo the day prior, I know there were a lot of people upset with the lines but I just took it all in stride. I do think MCM could have organized it so that you didn’t have one line for bibs and an entirely new line to get everything else (designed to make you go to inside to the expo). I think the MCM race itself was fantastic, a great course with awesome support and unique views and organized very well. I have to close this post with a wholehearted “THANK YOU” to everyone who has encouraged me and supported me along the journey to 26.2! A few very special thank you’s… to one of my best friends Sarah who ALWAYS asked me about my training and told me I could do it when I wasn’t as sure. To Patty who I could always count on to cheer me on virtually during my long training runs and was the first person to congratulate me after I finished. To Natascia and Dutch, two running rockstars, who I looked forward to running with every week during our lululemon run club – no matter how many miles I had planned for that day they were always down to run with me. And finally a special thank you to my boyfriend Bill who had to live with me while I trained and was always supportive even when I got stuck in a massive rain and lightning storm forcing him to wake up to come get me, and who came to the marathon and spent hours scanning the crowds of runners just to find me and cheer me on and take pictures. Thank you, you have no idea how much I appreciate it!!! 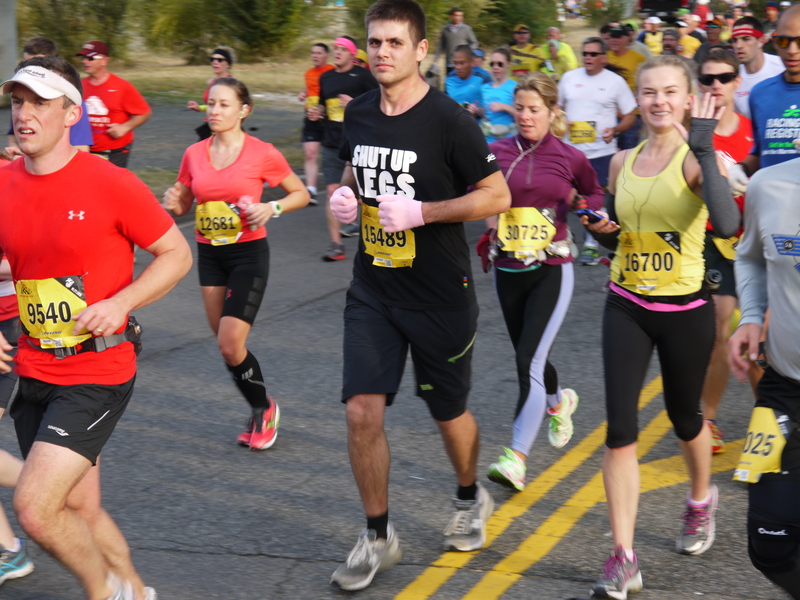 Congrats on finishing your first marathon, and with an excellent time! MCM was a really tough course — I’m sure you’re going to crush it at your next attempt. Thank you Jen! And congrats to you too! 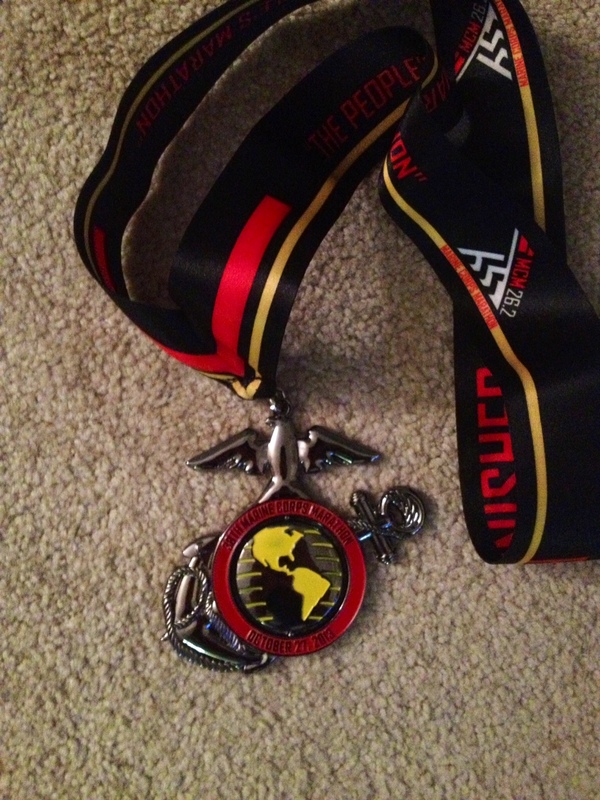 Congratulations on your great success in the Marine Corps Marathon. It is truly a special run. Don’t beat yourself up over your time, I too wanted to break 4 hours and came in just shy at 4:05:05, but simply finishing this race is an accomplishment in and of itself. Thank you Dave, we came in pretty close time wise! It was a special run, I definitely enjoyed the entire weekend. Congrats on your great MCM run! I run it in 5 weeks and I’m getting nervous. You just never know what your race pace will be and that part is freaking me out a bit (even though I’m trying to convince myself I don’t care about time). I really hope the crowd support you mentioned helps me get through it easier too! Nervousness is all part of the experience, totally normal! Underneath the nervousness, I try to stay calm and collected so that energy (that could be used on race day) isn’t wasted on things that are out of my control. Keep an eye on your pace but also keep it in perspective – to me finishing comes first, pace comes second. You will have such an amazing time, so excited for you! !